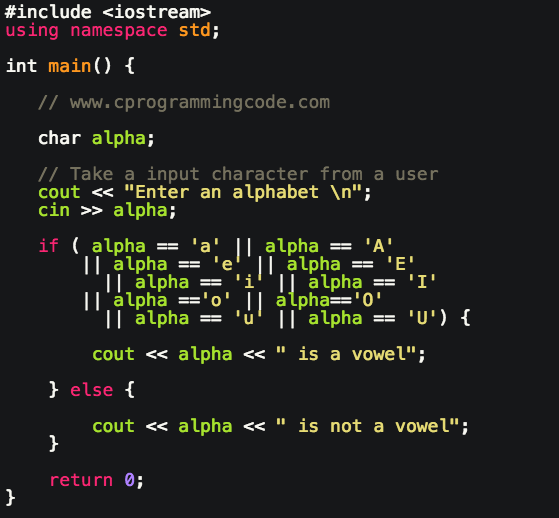 Write a C++ program to check whether a character is vowel or consonant. Given an input character, we have to write a code to check whether an entered character is vowel or consonant. An alphabet a, e, i, o, u is called as vowel and the rest of the alphabet is called as a consonant. i) Take an input alphabet from user. ii) Check whether an input alphabet is a, e, i, o, u, A, E, I, O, U then it's a vowel otherwise it's a consonant. 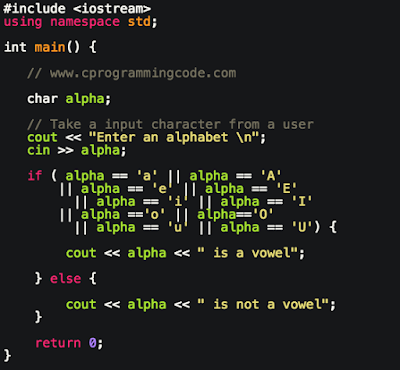 In this programming example, we are going to write a C++ code which takes an input character and check whether a character is vowel or consonant. In this example, we have created separate function to check whether a character is vowel or consonant. When a user input an alphabet, we called isVowel() method, which return true if the input character is vowel otherwise it returns false.